This article is about guided missiles. For other uses, see Missile (disambiguation). For unguided missiles, see projectile. In a modern military, a missile is a self-propelled guided weapon system, as opposed to an unguided self-propelled munition, referred to as just a rocket. Missiles have four system components: targeting and/or guidance, flight system, engine, and warhead. Missiles come in types adapted for different purposes: surface-to-surface and air-to-surface missiles (ballistic, cruise, anti-ship, anti-tank, etc. 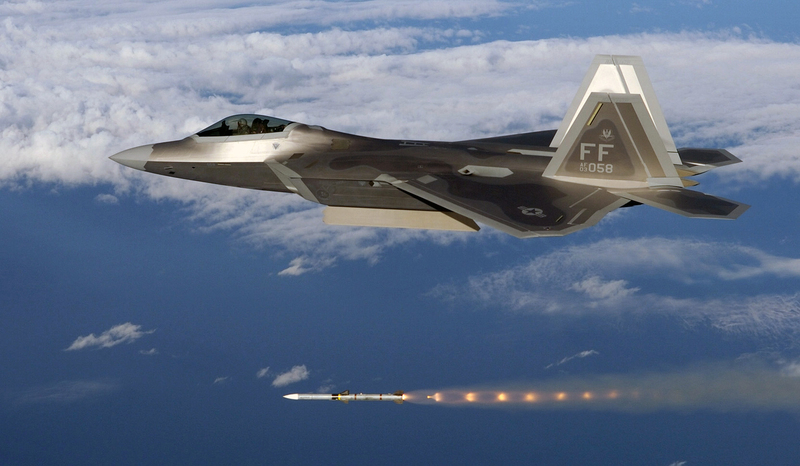 ), surface-to-air missiles (anti-aircraft and anti-ballistic), air-to-air missiles, and anti-satellite missiles. All known existing missiles are designed to be propelled during powered flight by chemical reactions inside a rocket engine, jet engine, or other type of engine. Non-self-propelled airborne explosive devices are generally referred to as shells and usually have a shorter range than missiles. An ordinary English-language usage predating guided weapons is "any thrown object", such as objects thrown at players by rowdy spectators at a sporting event. The word missile comes from the Latin verb mittere, meaning "to send". A powered, unguided munition is known as a rocket. Unpowered munitions not fired from a gun are called bombs whether guided or not; unpowered, guided munitions are known as guided bombs or "smart bombs". Munitions that are fired from a gun are known as projectiles whether guided or not. If explosive they are known more specifically as shells or mortar bombs. A Powered munitions that travel through water are called torpedoes (an older usage includes fixed torpedoes, which might today be called mines). Hand grenades are not usually classed as missiles. A common further sub-division is to consider ballistic missile to mean a munition that follows a ballistic trajectory and cruise missile to describe a munition that generates lift. The first missiles to be used operationally were a series of missiles developed by Nazi Germany in World War II. Most famous of these are the V-1 flying bomb and V-2, both of which used a simple mechanical autopilot to keep the missile flying along a pre-chosen route. Less well known were a series of anti-shipping and anti-aircraft missiles, typically based on a simple radio control system directed by the operator. However, these early systems in World War II were only built in small numbers. Missiles may be targeted in a number of ways. The most common method is to use some form of radiation, such as infrared, lasers or radio waves, to guide the missile onto its target. This radiation may emanate from the target (such as the heat of an engine or the radio waves from an enemy radar), it may be provided by the missile itself (such as a radar) or it may be provided by a friendly third party (such as the radar of the launch vehicle/platform, or a laser designator operated by friendly infantry). The first two are often known as fire-and-forget as they need no further support or control from the launch vehicle/platform in order to function. Another method is to use a TV camera—using either visible light or infra-red—in order to see the target. 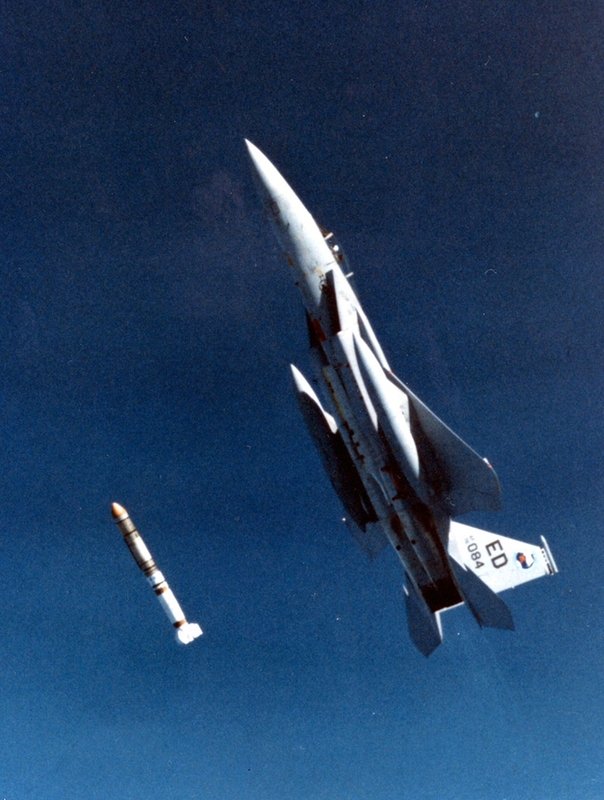 The picture may be used either by a human operator who steers the missile onto its target, or by a computer doing much the same job. One of the more bizarre guidance methods instead used a pigeon to steer the missile to its target. Many missiles use a combination of two or more of the above methods, to improve accuracy and the chances of a successful engagement. Another method is to target the missile by knowing the location of the target, and using a guidance system such as INS, TERCOM or GPS. This guidance system guides the missile by knowing the missile's current position and the position of the target, and then calculating a course between them. This job can also be performed somewhat crudely by a human operator who can see the target and the missile, and guides it using either cable or radio based remote-control, or by an automatic system that can simultaneously track the target and the missile. Furthermore, some missiles use initial targeting, sending them to a target area, where they will switch to primary targeting, using either radar or IR targeting to acquire the target. Whether a guided missile uses a targeting system, a guidance system or both, it needs a flight system. The flight system uses the data from the targeting or guidance system to maneuver the missile in flight, allowing it to counter inaccuracies in the missile or to follow a moving target. There are two main systems: vectored thrust (for missiles that are powered throughout the guidance phase of their flight) and aerodynamic maneuvering (wings, fins, canards, etc.). Missiles are powered by an engine, generally either a type of rocket or jet engine. Rockets are generally of the solid fuel type for ease of maintenance and fast deployment, although some larger ballistic missiles use liquid fuel rockets. Jet engines are generally used in cruise missiles, most commonly of the turbojet type, due to its relative simplicity and low frontal area. Turbofans and ramjets are the only other common forms of jet engine propulsion, although any type of engine could theoretically be used. Missiles often have multiple engine stages, particularly in those launched from the surface. These stages may all be of similar types or may include a mix of engine types - for example, surface-launched cruise missiles often have a rocket booster for launching and a jet engine for sustained flight. Some missiles may have additional propulsion from another source at launch; for example the V1 was launched by a catapult and the MGM-51 was fired out of a tank gun (using a smaller charge than would be used for a shell). Missiles generally have one or more explosive warheads, although other weapon types may also be used. The warhead or warheads of a missile provides its primary destructive power (many missiles have extensive secondary destructive power due to the high kinetic energy of the weapon and unburnt fuel that may be on board). Warheads are most commonly of the high explosive type, often employing shaped charges to exploit the accuracy of a guided weapon to destroy hardened targets. Other warhead types include submunitions, incendiaries, nuclear weapons, chemical, biological or radiological weapons or kinetic energy penetrators. Warheadless missiles are often used for testing and training purposes. After the boost-stage, ballistic missiles follow a trajectory mainly determined by ballistics. The guidance is for relatively small deviations from that. Ballistic missiles are largely used for land attack missions. 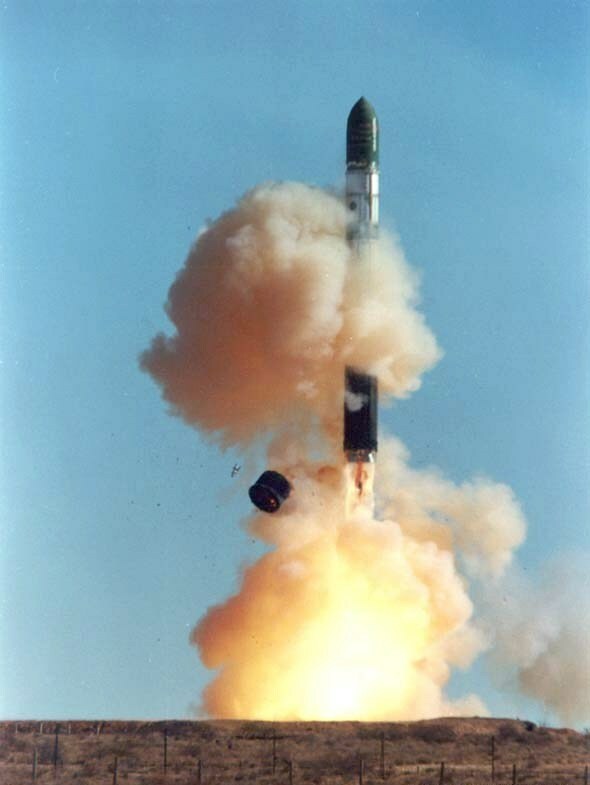 Although normally associated with nuclear weapons, some conventionally armed ballistic missiles are in service, such as ATACMS. The V2 had demonstrated that a ballistic missile could deliver a warhead to a target city with no possibility of interception, and the introduction of nuclear weapons meant it could efficiently do damage when it arrived. The accuracy of these systems was fairly poor, but post-war development by most military forces improved the basic inertial platform concept to the point where it could be used as the guidance system on ICBMs flying thousands of kilometers. Today the ballistic missile represents the only strategic deterrent in most military forces, however some ballistic missiles are being adapted for conventional roles, such as the Russian Iskander or the Chinese DF-21D anti-ship ballistic missile. Ballistic missiles are primarily surface launched from mobile launchers, silos, ships or submarines, with air launch being theoretically possible with a weapon such as the cancelled Skybolt missile. The V1 had been successfully intercepted during World War II, but this did not make the cruise missile concept entirely useless. After the war, the US deployed a small number of nuclear-armed cruise missiles in Germany, but these were considered to be of limited usefulness. Continued research into much longer ranged and faster versions led to the US's SM-64 Navaho, and its Soviet counterparts, the Burya and Buran cruise missile. However, these were rendered largely obsolete by the ICBM, and none were used operationally. Shorter-range developments have become widely used as highly accurate attack systems, such as the US Tomahawk missile, the Russian Kh-55 the German Taurus missile and the Pakistani Babur cruise missile.The BrahMos cruise missile which is a joint venture between India and Russia. The Brahmos is different in this class as it's a supersonic cruise missile which can travel much faster(2-3m) than other cruise missile which are subsonic. Cruise missiles are generally associated with land attack operations, but also have an important role as anti-shipping weapons. They are primarily launched from air, sea or submarine platforms in both roles, although land based launchers also exist. Another major German missile development project was the anti-shipping class (such as the Fritz X and Henschel Hs 293), intended to stop any attempt at a cross-channel invasion. However the British were able to render their systems useless by jamming their radios, and missiles with wire guidance were not ready by D-Day. After the war the anti-shipping class slowly developed, and became a major class in the 1960s with the introduction of the low-flying jet- or rocket-powered cruise missiles known as "sea-skimmers". These became famous during the Falklands War when an Argentine Exocet missile sank a Royal Navy destroyer. By the end of WWII all forces had widely introduced unguided rockets using HEAT warheads as their major anti-tank weapon (see Panzerfaust, Bazooka). However these had a limited useful range of a 100 m or so, and the Germans were looking to extend this with the use of a missile using wire guidance, the X-7. After the war this became a major design class in the later 1950s, and by the 1960s had developed into practically the only non-tank anti-tank system in general use. During the 1973 Yom Kippur War between Israel and Egypt, the 9M14 Malyutka (aka "Sagger") man-portable anti-tank missile proved potent against Israeli tanks. While other guidance systems have been tried, the basic reliability of wire-guidance means this will remain the primary means of controlling anti-tank missile in the near future. Anti tank missiles may be launched from aircraft, vehicles or by ground troops in the case of smaller weapons. By 1944 US and British air forces were sending huge air fleets over occupied Europe, increasing the pressure on the Luftwaffe day and night fighter forces. The Germans were keen to get some sort of useful ground-based anti-aircraft system into operation. Several systems were under development, but none had reached operational status before the war's end. The US Navy also started missile research to deal with the Kamikaze threat. By 1950 systems based on this early research started to reach operational service, including the US Army's Nike Ajax, the Navy's "3T's" (Talos, Terrier, Tartar), and soon followed by the Soviet S-25 Berkut and S-75 Dvina and French and British systems. Anti-aircraft weapons exist for virtually every possible launch platform, with surface-launched systems ranging from huge, self-propelled or ship-mounted launchers to man portable systems. Like most missiles, the Arrow missile, S-300, S-400, Advanced Air Defence and MIM-104 Patriot are for defense against short-range missiles and carry explosive warheads. German experience in World War II demonstrated that destroying a large aircraft was quite difficult, and they had invested considerable effort into air-to-air missile systems to do this. Their Me-262's jets often carried R4M rockets, and other types of "bomber destroyer" aircraft had unguided rockets as well. In the post-war period the R4M served as the pattern for a number of similar systems, used by almost all interceptor aircraft during the 1940s and '50s. Lacking guidance systems, such rockets had to be carefully aimed at relatively close range to successfully hit the target. The US Navy and U.S. Air Force began deploying guided missiles in the early 1950s, most famous being the US Navy's AIM-9 Sidewinder and USAF's AIM-4 Falcon. These systems have continued to advance, and modern air warfare consists almost entirely of missile firing. In the Falklands War, less powerful British Harriers were able to defeat faster Argentinian opponents using AIM-9G missiles provided by the United States as the conflict began. The latest heat-seeking designs can lock onto a target from various angles, not just from behind, where the heat signature from the engines is strongest. Other types rely on radar guidance (either on-board or "painted" by the launching aircraft). Air to Air missiles also have a wide range of sizes, ranging from helicopter launched self-defense weapons with a range of a few kilometers, to long range weapons designed for interceptor aircraft such as the Vympel R-37. In the 1950s and 1960s, Soviet designers started work on an anti-satellite weapon, called the "Istrebitel Sputnik", which meant literally, interceptor of satellites, or destroyer of satellites. After a lengthy development process of roughly 20 years, it was finally decided that testing of the Istrebitel Sputnik be canceled. This was when the U.S. started testing their own systems. The Brilliant Pebbles defense system proposed during the 1980s would have used kinetic energy collisions without explosives. Anti satellite weapons may be launched either by an aircraft or a surface platform, depending on the design. To date, only a few known tests have occurred. ↑ "World’s military powers". The Independent. http://www.independent.co.ug/index.php/reports/world-report/74-world-report-/172-worlds-military-powers.